Thomas Milton was born in 1885 at Yeovil. He was the son of James Milton (1846-1931), originally from Uffculme, Devon, and Keziah née Purchase (1845-1914) originally from Hardington. James was a Colour Sergeant in the Royal Marines Artillery and consequently he and Kezia moved around a lot during their early marriage as evidenced by the birthplaces of their children: William Charles (b1870, Hardington), Robert James (b1872, Hardington), George (b1874, Evershot), Charlotte (b1876, Evershot), Susan Elizabeth (b1880, Portsmouth), John (b1881, Portsmouth - 1917), Edith Rose, known as Rose (1882, Portsmouth -1960), Joseph (b1883, Portsmouth), Thomas,, Samuel (1887, Yeovil -1961), Charles (b1889, Yeovil) and Charlotte Ruth (1897, Yeovil -1898). 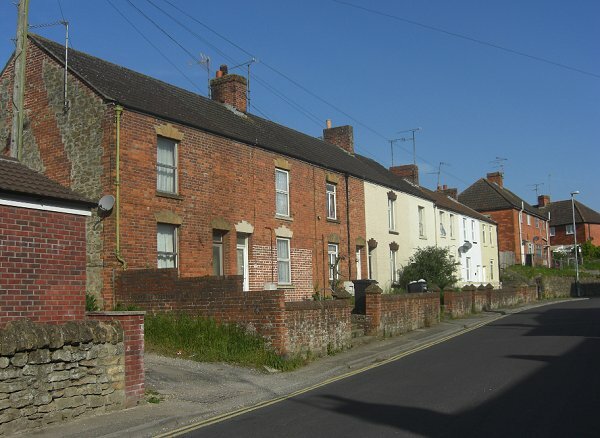 As seen above, the family appear to have settled in Yeovil from around 1885 when James left the army. In the 1891 census the family were listed at 1 Beaconsfield Terrace, St Michael's Avenue, and James gave his occupation as a steward in a club (actually the Ivel Club in Frederick Place). The family were still at this address by the 1901 census at which time 16-year old Thomas gave his occupation as a shop assistant in a grocery. Thomas enlisted in the Royal Field Artillery in the early 1900s, serving for eight years. As a Reservist he was called up at the beginning of the war and re-joined the Royal Field Artillery. His Service Number was 17921. The Royal Field Artillery was the most numerous arm of the artillery. The horse-drawn RFA was responsible for the medium calibre guns and howitzers deployed close to the front line and was reasonably mobile. Thomas soon found himself in France with the British Expeditionary Force. The actions in which Thomas fought are unknown, with the exception of the 1916 Battles of the Somme. The Battles for the Somme have a unique place in British military history. Haig was in the middle of preparations for a British offensive but came under strong pressure to mount an attack due the French commitment to the Battle for Verdun, a city which held an important place in the nation's psyche and that the Germans had attacked in February 1916. Any Allied offensive would therefore have to be carried mainly by the British. Haig was therefore forced to undertake an offensive near to where the British and French lines met, near Bray-sur-Somme in Picardy, although he would have preferred to attack further north and to have had longer with which to prepare his new army. Haig's plan called for Rawlinson’s Fourth Army to achieve a breakthrough in the centre after which Gough’s Reserve Army (later renamed the Fifth Army) would exploit, roll up the German defences and capture Bapaume. Allenby's Third Army would undertake a diversionary attack on Gommecourt, which lay to the north. The massive preparatory bombardment, meant to destroy the German defences started on 24 June 1916 at 06.00. Over 1.7 million shells were fired but a high proportion, some 30 percent, failed to explode as the Ministry of Munitions had abandoned any semblance of quality control in order to be able to produce the quantities needed in time. Tunnelling companies dug hollowed out chambers underneath key German strongpoints and filled them with explosives. The shelling had started on 'U' Day and was meant to go on until 'Z' Day, which was 29 June 1916 but heavy rains caused the approach roads, trenches and crater ridden No-Man's land too muddy and so the assault was postponed until 1 July. Just after dawn on 1 July, the first British wave clambered out of their trenches and started to make their way towards the German frontline. As they did, seventeen enormous mines were detonated and the barrage moved forward. The infantry followed behind and although there were local gains on the first day, generally things looked bleak. The British suffered 57,470 casualties (19,240 killed and 2,152 missing) which was an unprecedented experience for the British Army. Seven 'New Army' divisions attacked, alongside three Territorial and four regular Army divisions. The French attack on the right of the British line was smaller than had been originally intended as troops had to be diverted to the fighting around Verdun but their attack went relatively successfully and the preponderance of heavy guns in the French sector also helped the British forces adjacent to them. The British Army suffered, over the course of the entire 142-day campaign, some 415,000 casualties. The Somme campaign involved some twelve separate battles and finally came to an end on 18 November 1916. It was during the Battles of the Somme that Thomas Milton was awarded the Military Medal, illustrated above. This was a military decoration awarded to personnel of the British Army and other services below commissioned rank, for bravery in battle on land. The medal was established on 25 March 1916. It was the other ranks' equivalent to the Military Cross, which was awarded to commissioned officers and, rarely, to warrant officers. The Military Medal ranked below the Distinguished Conduct Medal, which was also awarded to non-commissioned members of the Army. During the late summer of 1917, while home on leave, Thomas married Elizabeth Coombes at Yeovil. They did not have a family. Thomas' brother Jack was killed in action on 26 October 1917 during the Battle of Passchendaele. Thomas was transferred to the 7th Divisional Signal Company, Royal Engineers - again, a somewhat fluid unit that tended to move around. His new Service Number was 251583. In November 1917 they relocated to Italy. Again, Thomas' involvement in the fighting on the Italian Front is unknown until he took part in the Battle of Vittorio Venito, also known as the Third Battle of the Piave: this was the final battle in Italy. The Battle of Vittorio Veneto was fought from 24 October to 3 November 1918 near Vittorio Veneto on the Italian Front. The Italian victory marked the end of the war on the Italian Front, secured the dissolution of the Austro-Hungarian Empire and contributed to the end of the First World War less than two weeks later. Just two weeks before the Armistice and having fought throughout the war, Thomas was fatally wounded on 31 October 1918 as he jumped into a trench and there was an immediate explosion. Thomas died from his wounds within five minutes. He was 34 years old. In its edition of 15 November 1918 the Western Gazette reported "Mr James Milton, the well-known and popular steward of the 'Ivel' Club, has received news this week that his son Sapper Thomas Milton, R.E., M.M., has been killed. 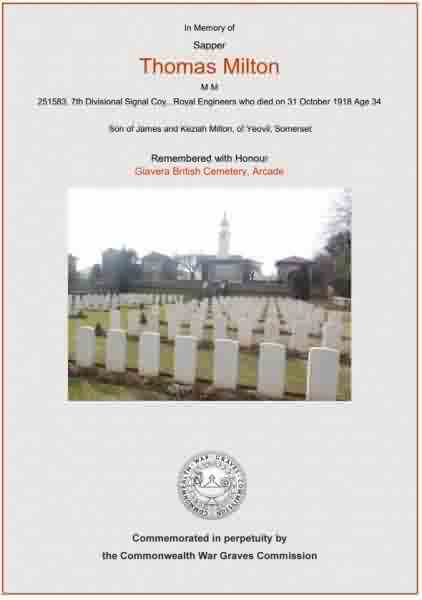 Sapper Milton was an 'Old Contemptible'. He had served eight years in the Army previous to war, and as a Reservist was mobilised in the early days, going to France with the Expeditionary Force, and had served four years and two months. In a letter to his father, an officer says that he was talking to his comrades outside a trench and when he had finished he jumped into the trench. Immediately there was an explosion, whether from a bomb in the trench or carried by Sapper Milton is not clear, but he was so seriously injured that he died within five minutes. Sapper Milton won the Military Medal in the Somme battles of 1916, and had recently been further recommended for his gallantry. Thirty-four years of age, he was married when on home leave about 14 months ago, but there is no family." Thomas Milton' was interred in Giavera British Cemetery, Arcade, Italy, Grave - 2.H.1. and his name is recorded on the War Memorial in the Borough. Beaconsfield Terrace in St Michael's Avenue. Photographed in 2014. The Milton family lived at No 1 - at extreme left. The Commonwealth War Graves Commission certificate in memory of Thomas Milton.